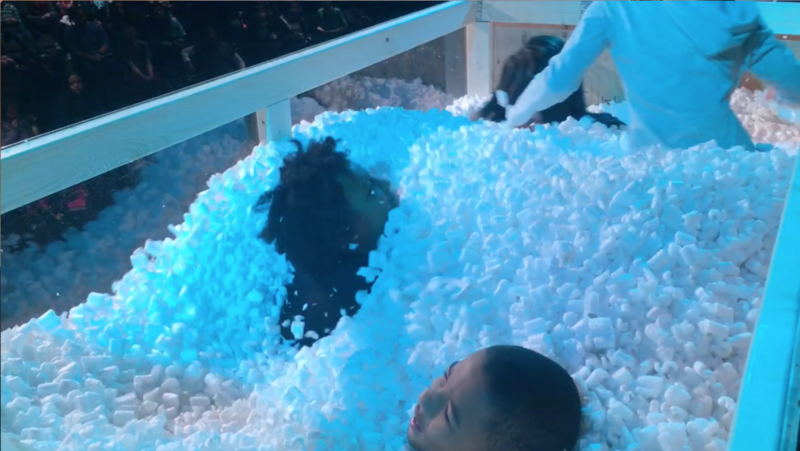 Every wonder what you could do with a whole bunch of packing peanuts? 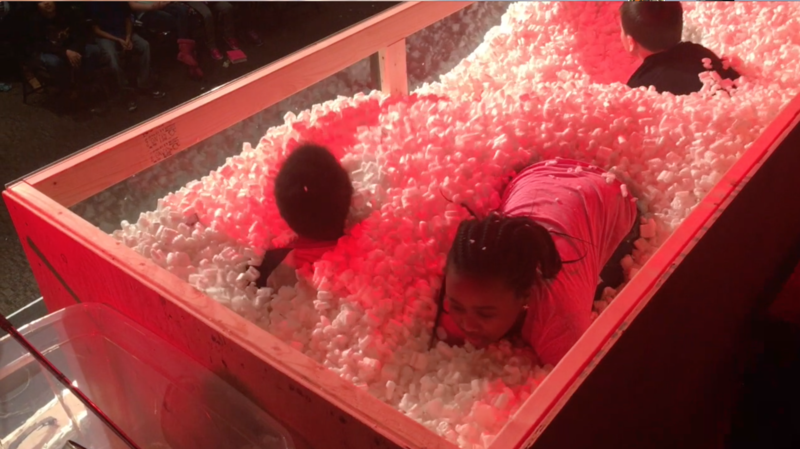 Well we did too so we decided to create a huge encasement filled to the brim with hundreds of cubit feet of packing peanuts. Our students couldn’t get enough of it! 1. A Pit. We made a 8ft long x 4 ft wide x 4ft height pit. We just took plywood and constructed a box without a top on it. The front was a thin sheet of Plexiglas so the audience could see inside the contraption. 2. Packing Peanuts. A lot. Like seriously a lot of packing peanuts. 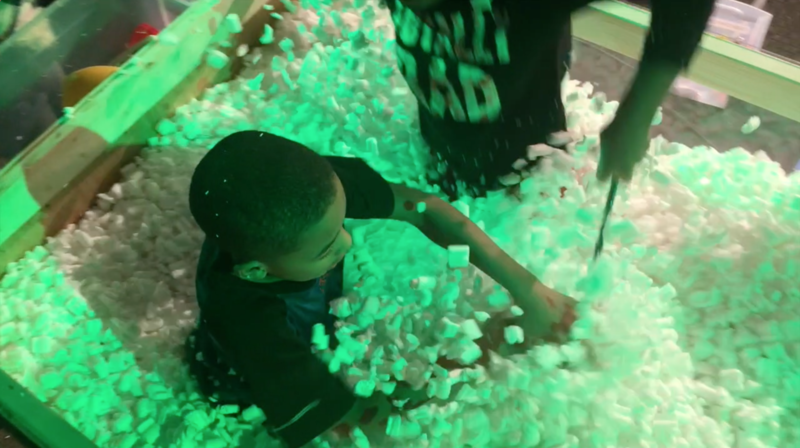 We bought about 150 cubit feet of packing peanuts to fill it up. 3. Various Items. We went to the local thrift store and bought anything we thought would be amazing to find in the pit of peanuts. We are talking lava lamps, toasters, golf clubs, rubber ducks, old movies, and a plastic angel. Have fun with it!! 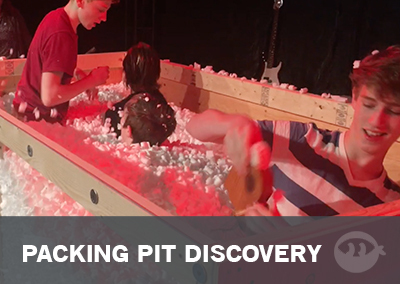 Depending on the size of your pit select an appropriate amount of players to get into the pit. Our pit fit 4 people so we selected 4. Next have them all get inside the pit. When you say GO they will have 6o seconds to collect as many items from within the pit as possible. We just had them throw them into a clear tote next to the pit. The person with the most items at the end of the round wins. Pretty simple but simply hilarious to watch and even more fun to play! Do you have the plans for how you built this? I would love to see them if so!